Backpropagation is a common method for training a neural network. There is no shortage of papers online that attempt to explain how backpropagation works, but few that include an example with actual numbers. This post is my attempt to explain how it works with a concrete example that folks can compare their own calculations to in order to ensure they understand backpropagation correctly. If this kind of thing interests you, you should sign up for my newsletter where I post about AI-related projects that I’m working on. You can play around with a Python script that I wrote that implements the backpropagation algorithm in this Github repo. For an interactive visualization showing a neural network as it learns, check out my Neural Network visualization. If you find this tutorial useful and want to continue learning about neural networks, machine learning, and deep learning, I highly recommend checking out Adrian Rosebrock’s new book, Deep Learning for Computer Vision with Python. I really enjoyed the book and will have a full review up soon. For this tutorial, we’re going to use a neural network with two inputs, two hidden neurons, two output neurons. Additionally, the hidden and output neurons will include a bias. The goal of backpropagation is to optimize the weights so that the neural network can learn how to correctly map arbitrary inputs to outputs. For the rest of this tutorial we’re going to work with a single training set: given inputs 0.05 and 0.10, we want the neural network to output 0.01 and 0.99. To begin, lets see what the neural network currently predicts given the weights and biases above and inputs of 0.05 and 0.10. To do this we’ll feed those inputs forward though the network. We figure out the total net input to each hidden layer neuron, squash the total net input using an activation function (here we use the logistic function), then repeat the process with the output layer neurons. Total net input is also referred to as just net input by some sources. We repeat this process for the output layer neurons, using the output from the hidden layer neurons as inputs. Some sources refer to the target as the ideal and the output as the actual. The is included so that exponent is cancelled when we differentiate later on. The result is eventually multiplied by a learning rate anyway so it doesn’t matter that we introduce a constant here . 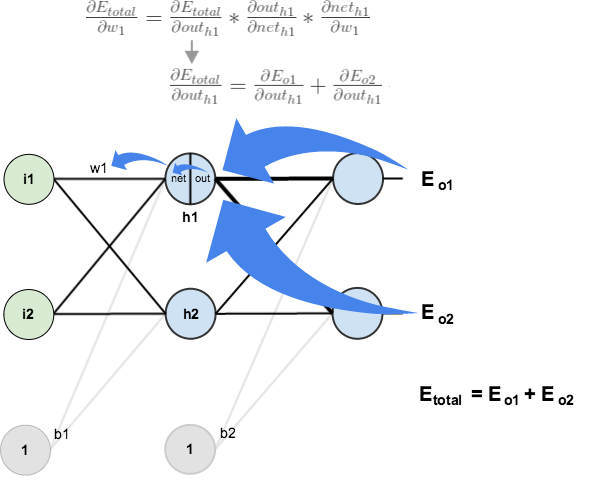 Our goal with backpropagation is to update each of the weights in the network so that they cause the actual output to be closer the target output, thereby minimizing the error for each output neuron and the network as a whole. Consider . We want to know how much a change in affects the total error, aka . is read as “the partial derivative of with respect to “. You can also say “the gradient with respect to “. We need to figure out each piece in this equation. First, how much does the total error change with respect to the output? When we take the partial derivative of the total error with respect to , the quantity becomes zero because does not affect it which means we’re taking the derivative of a constant which is zero. Next, how much does the output of change with respect to its total net input? Finally, how much does the total net input of change with respect to ? Some sources use (alpha) to represent the learning rate, others use (eta), and others even use (epsilon). We perform the actual updates in the neural network after we have the new weights leading into the hidden layer neurons (ie, we use the original weights, not the updated weights, when we continue the backpropagation algorithm below). Next, we’ll continue the backwards pass by calculating new values for , , , and . Finally, we’ve updated all of our weights! When we fed forward the 0.05 and 0.1 inputs originally, the error on the network was 0.298371109. After this first round of backpropagation, the total error is now down to 0.291027924. It might not seem like much, but after repeating this process 10,000 times, for example, the error plummets to 0.0000351085. At this point, when we feed forward 0.05 and 0.1, the two outputs neurons generate 0.015912196 (vs 0.01 target) and 0.984065734 (vs 0.99 target). If you’ve made it this far and found any errors in any of the above or can think of any ways to make it clearer for future readers, don’t hesitate to drop me a note. Thanks!